Take a bow: Caoimhin O Raghallaigh gives a modern, experimental spin to Irish traditional music. I was sitting on the hard pews of the Unitarian Church on Dublin's Stephen's Green when I first heard Caoimhin O Raghallaigh play live. Playing in near darkness -- he was bathed only in the faintest blue light -- the fiddler wrung the most extraordinarily haunting sounds from his five-string viola. Rich with melancholy and the infinite sadness, the notes filled the room with their own particular kind of blue. But then came the joyful uplift. O Raghallaigh brought on an Indian percussionist to spar with, who beat out a kinetic rhythm on his African djembe drum and then got down on his knees to hammer away at a set of gourds. As O Raghallaigh himself said of one of his collaborators, which equally applies to himself: "Not alone do you not know what's going to happen next, but you don't know what just happened." 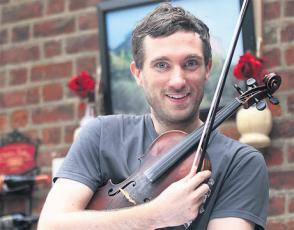 Although the 29-year-old Dubliner makes his living as a professional fiddle player and grew up immersed in the traditional Irish music scene (he spent two years living in Miltown Malbay in Co Clare -- "the trad Mecca" -- and worked as a trad music archivist and uileann pipe maker), the tunes he played in the church -- his altar-ego, if you like -- were a far cry from mainstream trad. They owed as much to classical musical, post-rock and even jazz than they did to our own indigenous folk music. O Raghallaigh's out-there experimentalism may alienate the trad purists, but it marks him out as a true maverick, a risk-taker revelling in his own creative independence. If we must list reference points, he's like the missing link between Martin Hayes and 'Purple Haze'; and any analysis of his musical DNA would also reveal the double-helix of Estonian composer Arvo Part and Iceland's Sigur Ros. And there are encouraging signs that our cultural tastemakers are alive to his talent: John Kelly regularly playlists his brilliant 2007 solo album Where The One-Eyed Man Is King on his Lyric Fm show, while online rock magazine State recently dubbed him "the most singular traditional Irish musician of (his) generation". I met up with up Caoimhin one lazy Sunday afternoon in a Dublin hotel ahead of his next show in St Audeon's medieval church on Dublin's High St. The performance is part of Note Production's four-pronged concert series known as The Fold, which styles itself as "a space for new improvised and experimental music". Caoimhin tops a bill that also features experimental rock duo Thread Pulls and a spoken word performance from Cathal Coughlan. The softly spoken Caoimhin speaks with an infectious enthusiasm about his craft and the other musicians he has worked with (in particular Iarla O Lionaird, accordionist Brendan Begley and uileann piper Mick O'Brien). He has played his fiddle all over the world, from Alaska to Australia, from Norway to China, the latter as part of a music-and-poetry double-up with Paul Muldoon and Nuala Ni Domhnaill. His devotion to his craft is such that he gave up a promising career as a theoretical physicist (he worked on a particle accelerator project in America after studying in Trinity College) to follow his muse. But he has never looked back. He still loves to play the bread-and-butter stuff -- slides and polkas, jigs and reels, slow airs -- but is increasingly drawn to developing his own individual style. "And then trying to create a new music that has the same effect on people with no background in traditional music. That's the idea. It's like taking the essence of the effect and allowing other people in on it." Caoimhin says that he is not alone in trying to push the boundaries of his chosen musical form. "All over the world, in other folk music traditions, there's a lot of people writing really interesting contemporary music which is very obviously directly related to folk music -- but isn't folk music. "I got really excited by some of these people, like Nils Okland, a hardanger fiddle player from Norway. He extracts the essential information and makes new music that's so beautiful. So I thought it would be interesting to see what would happen if I tried to do a similar thing with our music. "My album Where The One-Eyed Man Is King opened up a whole new listenership. They don't need a background in traditional music to get it. So I'm trying to communicate to people who might have switched off." I mention how for me his music has echoes of Arvo Part and Sigur Ros, and Caoimhin's eyes light up: "The space is the big thing with Arvo Part," he gushes. "I really wanted to figure out how to have space -- and lots of it -- in my music. "And I love Sigur Ros so much. The sense of time is beautiful in it -- the long time scales, which is like Arvo Part. In traditional music, a lot of people are focused on the notes. I'm more interested in the texture. If you were to chew on it, what textures would you be able to taste? "We're really lucky because the traditional music we have is incredibly rich. Like, say, sean-nos singing: you could dive forever into that and continually come up with things that are so beautiful and so relevant to so many people. "It's curious that more people aren't doing it."